The Departments of Homeland Security and Defense spent over $3.6 million to cover travel costs and other expenses for President Obama's golf getaway weekend in 2013 at an exclusive Florida resort with Tiger Woods, the Government Accountability Office reported Wednesday. GAO's audit showed that travel costs made up a significant amount of the total expenses for Obama's trip. For example, operating Air Force One cost $200,000 per hour of flight. Beyond Air Force One, there was a squadron of "supporting aircraft and U.S. Coast Guard small boats," the Washington Times reported. The military transport aircraft needed for the golfing weekend included a $200 million C-17 Globemaster and the C-5 Super Galaxy, which departed from various U.S. Air Force bases and arrived at Joint Base Andrews or Marine Corps Base Quantico "to transport Secret Service personnel and vehicles and Marine Corps personnel and helicopters to support the trip before returning to their air bases of origin," the report said. In all, Mr. Obama's four-day excursion required six additional military transport planes flying eight missions with at least 22 total flight legs, involving 14 commercial airports and Air Force bases ranging from Joint Base McGuire in New Jersey to Dyess Air Force Base in Texas. The Pentagon spent at least $2.8 million, and the Homeland Security Department spent another $767,000, which included about $180,000 for the Secret Service. A couple days after Obama delivered his 2013 State of the Union Address, he flew from Washington to Chicago to give an economic speech on building a stronger middle class. Following his speech, Obama flew from Chicago to an airport in West Palm Beach, Florida on Air Force One. Obama was then driven to Palm City, which holds the ritzy Floridian Yacht and Golf Club where Obama played golf with Woods and reportedly got lessons from his former coach, Butch Harmon. The Houston Astros owner and businessman Jim Crane owns the golf resort where Obama played with Woods. The Times reported that the private club on the St. Lucie River includes "eight cottages, a 68-slip deep-water marina, the club’s 61-foot yacht, and a private helicopter service with two helipads." The GAO also reported that the Coast Guard spent about $586,000 providing support for Obama's trip. "Specifically, this trip included the use of the RB-S boat and HH-65 Dolphin helicopter [a MedEvac-capable search and rescue helicopter] to provide support in waterways," the GAO said. As for the Pentagon's expenses that weekend, the GAO said, "According to White House officials, to be able to communicate instantly with the U.S. military, the President flies on military aircraft whenever he travels–whether for official, political, or other non-official reasons." Sen. John Barrasso (R., Wyo.) made the audit request, which took approximately 20 months to complete. While the report indicated that the GAO could not determine the true cost of the golf weekend due to classified Pentagon expenses, the $3.6 million figure was enough to irk Barrasso due to the timing of Obama's trip. It took place when the Obama administration and Congress were putting automatic spending caps into place. "At a time when the government was tightening its belt to prepare for sequestration, President Obama had such little disregard for the taxpayer that he spent millions of dollars to play golf with Tiger Woods," Mr. Barrasso said. "This arrogance is par for the course for the Obama administration." 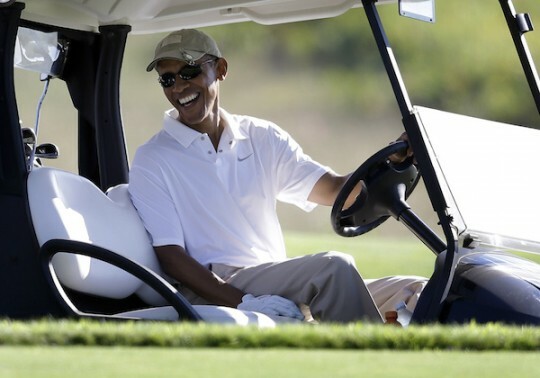 Obama has played over 300 rounds of golf since he took the oath of office in January 2009. This entry was posted in Politics and tagged Air Force One, Barack Obama, Golf, Government Waste. Bookmark the permalink.